From a backwater village on the Erie Canal to a world-renowned lumber distribution and manufacturing center, the growth of the twin cities of Tonawanda and North Tonawanda resonates with the sounds of a growing nation. By the beginning of the 20th century, the little village of Tonawanda had expanded into two cities, one on each side of the canal, with a burgeoning population of European immigrants and a landscape overwhelmed by industry. 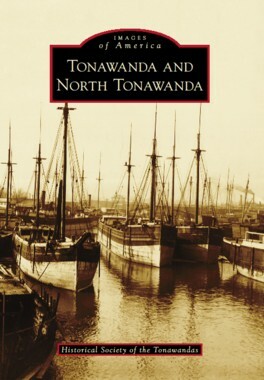 In Tonawanda and North Tonawanda, over 200 photographs, many never before published, transport the reader from 1860 to 1960 as the influx of immigrants and industry transformed the landscape and character of western New York. The images speak of rich lumber barons, craftsmen, inventors, bankers, and entrepreneurs with names like Rand, Richardson, Herschell, Spillman, Wurlitzer, and White. Photographs capture manufacturing products from silk garments to office equipment, pig iron to cruise boats, carousel horses to player pianos, and boxboards to jukeboxes.